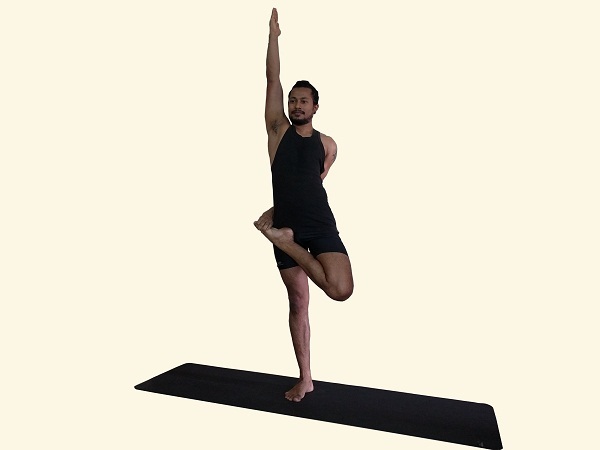 Stand in Tadasana (Mountain pose). Separate your feet about hips width apart. Bend your right knee, hold the right ankle with the right hand and place the heel on or above the left thigh as high as possible, the sole of the foot should face the sky. Grab the right ankle with the left hand and bring the right hand back and try to hold the right big toe. Stretch your left hand towards the sky and look at any fixed point in front of you. Stay in the pose for about 30 seconds breathing normally. Release the posture and repeat the same on the other side for equal amount of time. If you cant reach the right toe with your right hand then hold the right leg with your left hand and stretch the right hand towards the sky.